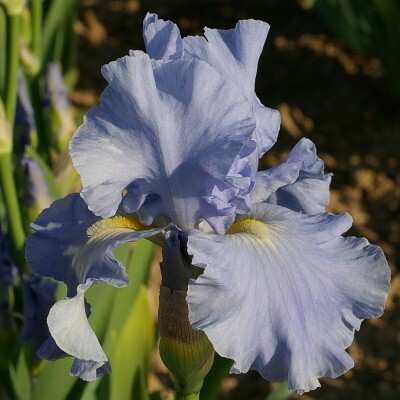 Marvellous really pure mid-blue, bred from two equally wonderful blues: "Yaquina Blue" and "Oregon Skies". Yellow beards tipped with blue, nearly invisible in this cerulean ocean. Very big flowers (10 cm x 16 cm), gently ruffled. 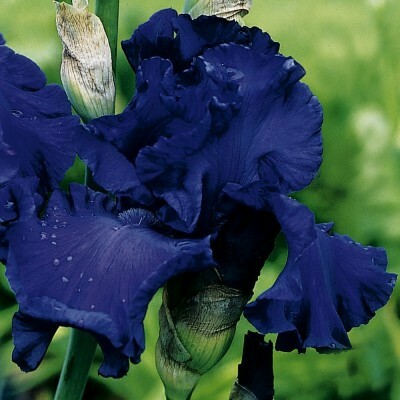 This dark navy blue produces enormous flowers: 18 cm x 11 cm on strong tall stems with four branches and 6 to 8 buds. Plain colour, even the beards are dark navy blue. 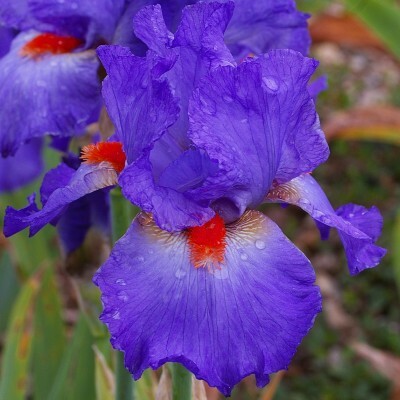 Blue irises with red beards are seldom seen! 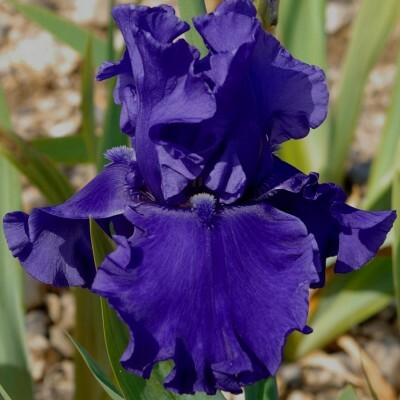 'Glad', with its purple-blue tones and big tangerine beards, fills this gap and thrills the eye. 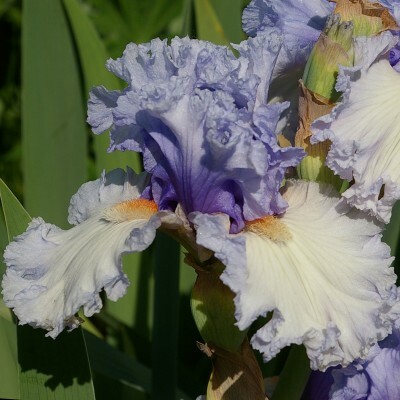 An average of 6-7 round shaped flowers per stalk. 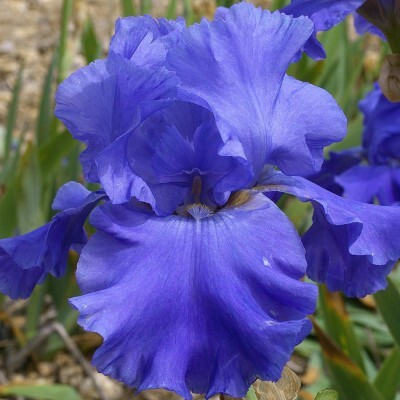 Clear pale blue like a cloudless spring morning sky, or a pale blue delphinium. The centre of the falls veers towards a soft white under the cream beards. Round, well-shaped flowers with semi-horizontal falls. 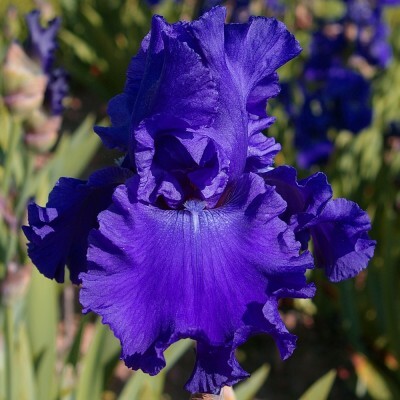 Vigorous growth, healthy foliage and reliably free-flowering. 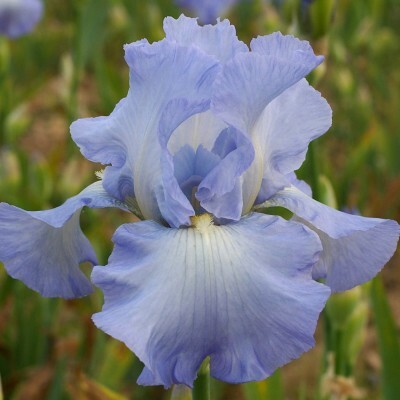 A child of the excellent "Dusky Challenger". 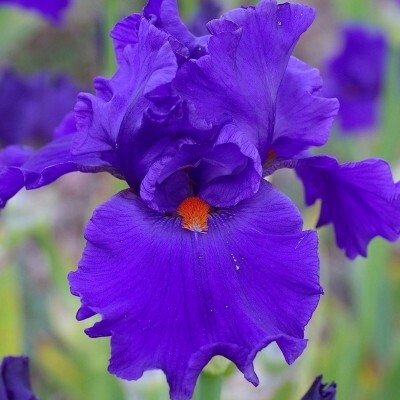 It is a rich navy blue (almost exempt from violet). 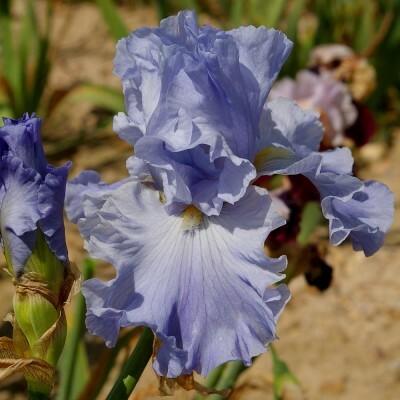 Vigorous grower and often three flowers blooming at the same time. Medium blue beards. RHS Award of Garden Merit in 2000. 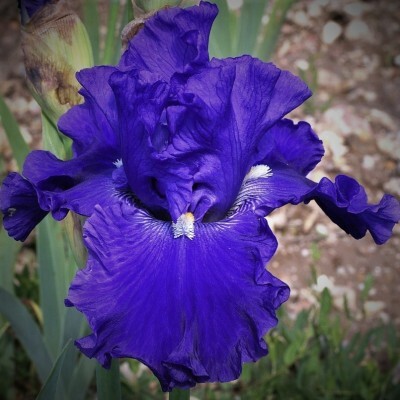 Very large flowers rippling with pure mid-blue tones, not a trace of violet in sight. 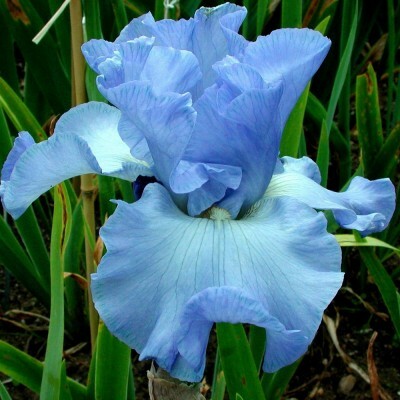 The pale yellow beards are discreet.The stalks can sometimes be a little heavyset, but what a fantastic blue! 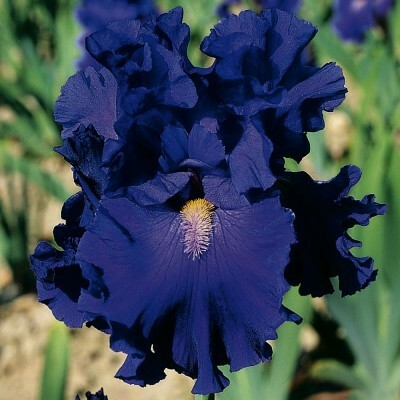 A blue giant, all ruffled up! 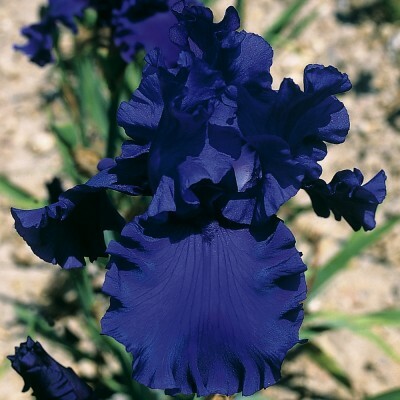 Son of "Jazz Me Blue", a pure, plain blue with enormous exuberant flowers with very ruffled edges. Due to its height, it is best to avoid very windy locations when planting. A delightful son of "Paul Black", but in no way a replica, with a nice balance between the size of the flowers and the foliage. 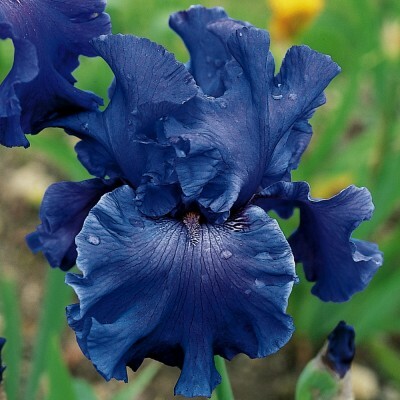 Solid medium blue-violet with contrasting bright red beards. Prolific and freeflowering. 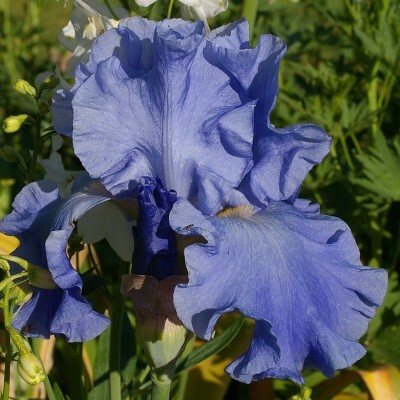 This is the result of the search for perfection in blue-red bearded irises. 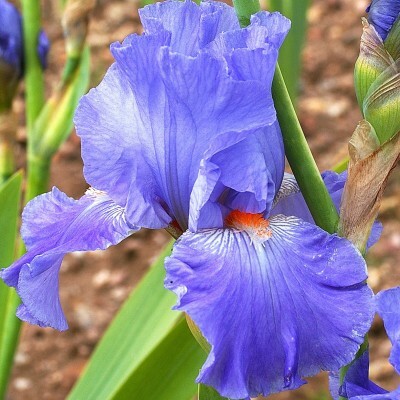 It is a pure light blue with orange-red beards. 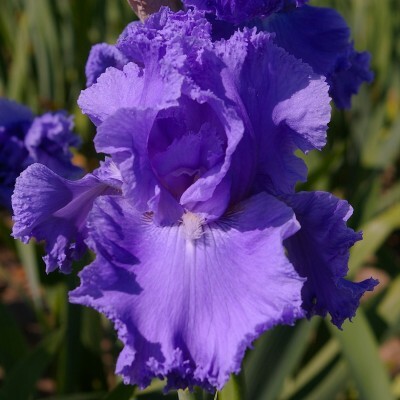 In addition to the purity of the colour, its growth habits, shape of the flowers and count of buds are excellent. 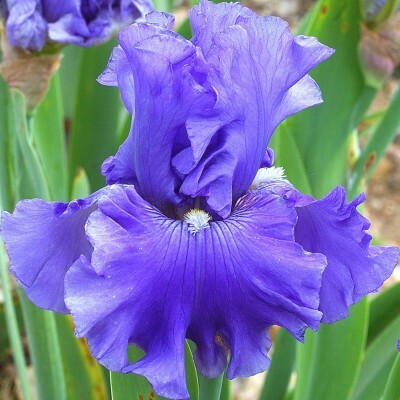 Prizewinner at the American Convention and the Florence International Iris Competition in 1998. Hyacinth blue standards and silvery hyacinth falls. 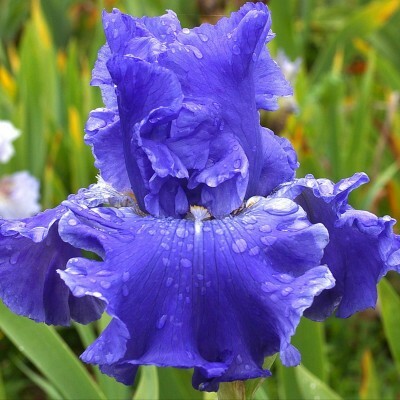 An eye-catcher in your garden with its outstanding height and unusual colour. Lightly ruffled. 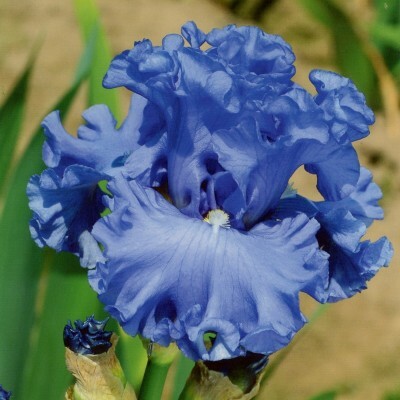 This rich pure medium-blue has an exuberance of ruffles and its round flowers are very wide and captivating. 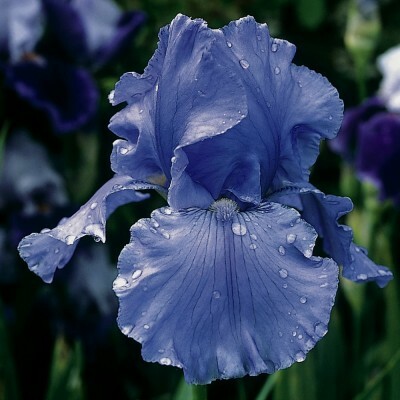 It gives an impression of strength and is an extremely vigorous grower.